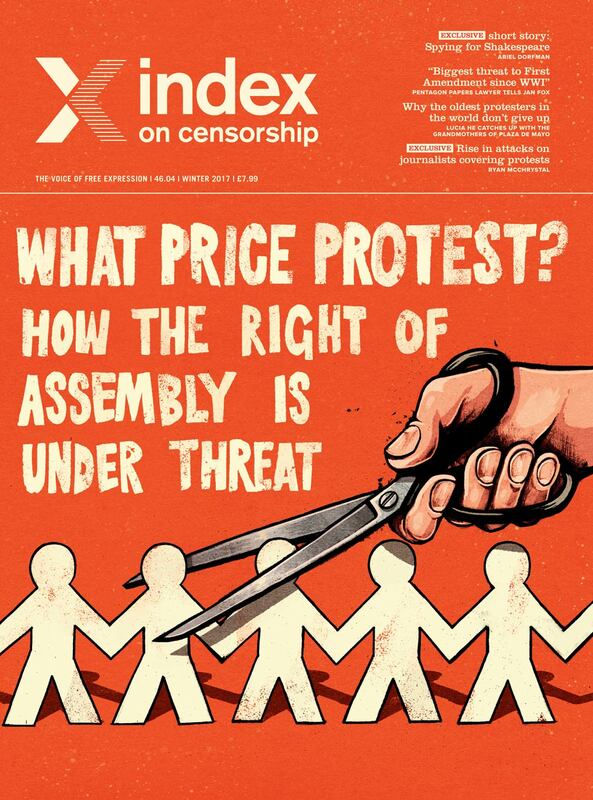 Index on Censorship is honoured to announce that our magazine has won an ‘Award of Excellence’ in the ‘Magazines, Journals & Tabloids – Writing (entire issue)’ category for the Awards for Publication Excellence (APEX). The award was given to our winter 2017 issue What price protest? How the right to assembly is under threat. This is the second year Index on Censorship has won an APEX award. Last year Index won a Grand Award in the same category for our issue Truth in danger, danger in truth: Journalists under fire and under pressure. APEX Awards are based on excellence in graphic design, editorial content and overall communications excellence. This year there were over 1,400 entries, with competition being “exceptionally intense”, the APEX site noted. “Each year, the quality of entries increases. Overall, this year’s entries displayed an exceptional level of quality,” it said. “We are thrilled to have received this award for a second year in a row. As the winning issue highlighted, the right to protest is under threat throughout the globe. We hope awards like this will raise awareness of this important issue, while also acknowledging the excellent standard of journalism and writing, design and hard work that goes into producing the magazine,” Jemimah Steinfeld, deputy editor of Index on Censorship magazine, said. The protest issue, which came out at the end of 2017, considered the relevance of the 1968 protests 50 years on. It looked at the areas where the 1968 protests had been concentrated, such as Prague and Paris, and addressed what relevance these protests still have today. It also looked at the current state of protest across the globe. Particularly notable articles included one from the UK-based writer Sally Gimson about how central areas in English cities are being privatised and with that the right to protest is under threat, and an article from Wael Eskander, an Egyptian journalist, about witnessing the dangers and now demise of protest in his country over the past few years. There were also contributions from Micah White, one of the co-founders of the Occupy movement, and an interview with the husband of Nazanin Zaghari-Ratcliffe, who spoke about the importance of protest in relation to his wife’s imprisonment. For more information on the protest issue click here. For more information on the APEX awards click here: http://apexawards.com/A2018_Win.List.pdf. The winter 2017 Index on Censorship magazine explores 1968 – the year the world took to the streets – to discover whether our rights to protest are endangered today. Micah White proposes a novel way for protest to remain relevant. Author and journalist Robert McCrum revisits the Prague Spring to ask whether it is still remembered. Award-winning author Ariel Dorfman‘s new short story — Shakespeare, Cervantes and spies — has it all. Anuradha Roy writes that tired of being harassed and treated as second class citizens, Indian women are taking to the streets. 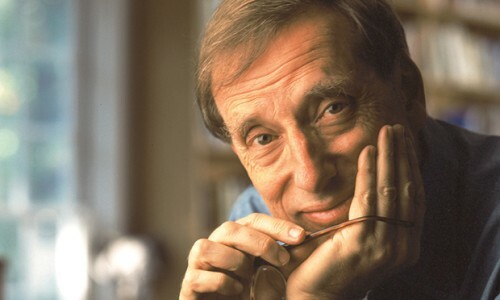 Ariel Dorfman is a playwright, author, essayist and human rights activist. His play Death and the Maiden won the 1992 Lawrence Olivier award and was adapted into a film. 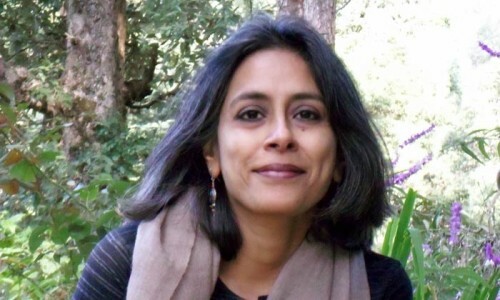 Anuradha Roy is an award-winning novelist, journalist and editor. She has written three novels, including Sleeping on Jupiter, which was long-listed for the Man Booker Prize. 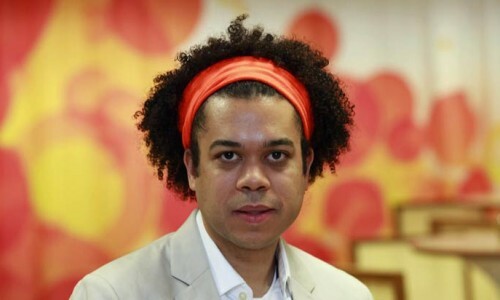 Micah White is an activist, journalist and academic, who co-created Occupy Wall Street. He is author of The End of Protest: A New Playbook for Revolution, which was published in 2016. Fifty years after 1968, the year of protests, increasing attacks on the right to assembly must be addressed, argues Rachael Jolley. Sadly this basic right, the right to protest, is under threat in democracies, as well as, less surprisingly, in authoritarian states. Fifty years after 1968, a year of significant protests around the world, is a good moment to take stock of the ways the right to assembly is being eroded and why it is worth fighting for. A look at what’s inside the winter 2017 issue, which explores the power of protest. Featuring interviews with authors in this issue. After Gothenburg and Frankfurt book fairs faced tension over who was allowed to attend, we asked four leading thinkers, Peter Englund, Ola Larsmo, Jean-Paul Marthoz, Tobias Voss, to debate the issue.